Two days prior our vacation in Bacolod the national news about the situation at the airport got my full attention. Last December 25, the NAIA Terminal 3 was packed more than usual and some irate passengers were recorded hurling expletives at those manning Cebu Pacific’s check-in counters. The video footage shows absolute disorder and it appears that these people aren’t just the regular grinches but rather those with valid reasons to forget the Christmas spirit altogether. I would soon experience the same frustration. Wanting to avoid falling victim to heavy traffic, Marcus and I left Batangas about six hours before our flight. Yes, six hours. We reached Park ‘N Fly earlier than expected despite a close call at SLEX Shell station when Marcus nearly choked himself out—no thanks to a Mentos mint that got me frantically recall how to execute a Heimlich maneuver—and slow traffic at Andrews Avenue due to an ongoing flyover project. We got one problem down. Our shuttle bus dropped us off to the next. NAIA terminal 3 was not as bad as reported but people being fixated to the check-in monitors like eager runners waiting for the starting gun to fire gave me some hint on what to expect. Trying to remain optimistic, I observed and actually started to conclude that ours could be a better day. My assessment was wrong. Our own Cebu Pacific experience happened after four hours of waiting patiently. Upon reaching Cebu Pacific’s check-in counter and a couple minutes of nervous finger tapping, I soon heard the attendant say the heartbreaking words: your flight is overbooked. To compensate for the missed flight we were offered free overnight stay in a hotel and re-scheduled to fly the next day. Conceding to a day of vacation lost, I accepted our fate—especially upon seeing Marcus excited at the idea of being in hotel—and weaved our push cart in and out of the crowd to another check-in counter. This time we lined up to the hotel accommodation queue where we spent almost 45 minutes inching our way to the counter together with foreign tourists. Marcus and I were with disappointed Italian, American, and Korean passengers of Cebu Pacific. After repeatedly answering Marcus’ questions about the hotel—“Is there a bath tub”, “What’s the size of the bed”, “Is there cable TV” among others—I found hope. The guy who said that our initial flight is overbooked got back to me and asked if I want to take the flight that will leave past 10 in the evening. I took the chance and got our boarding pass minutes later. Two hours before our new flight we were already at the boarding gate 133 area. In between his Jetpack Joyride and Minecraft games, Marcus would take a glance at the digital clock and counted the minutes to go. Sadly, we were soon listening to the ’on-behalf-of-Cebu-Pacific-we-regret-to-inform-you’ spiel. The advisory happened over and over. 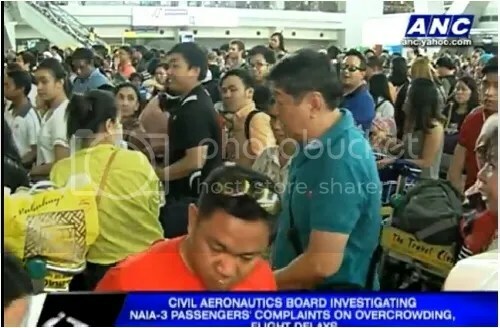 Flights to both Cebu and Bacolod got delayed several times that people around us started booing the equally helpless Cebu Pacific ground personnel. I didn’t participate—I was busy spoon-feeding Marcus the free Jollibee Chicken Joy meal and noodles that the airline provided. The area was almost deserted when our plane finally arrived. It was past one o’clock in the morning. The Krispy Kreme and Army Navy stores were already dark and when the time to board was announced the passengers lined up to the gate tired but happy to get out of the place. 16 hours after we left Batangas we arrived in Bacolod. (Come to think of it we could be ready for longer flights—like one going to the land of milk and honey.) I am now keeping my fingers crossed that we will have a better trip back to Manila tomorrow. Ever had one of those problems wherein you search the internet and the only solution you’ll find is one that seems absurd? Well, I got one lately. This is about the mysterious case of our Honda City which happened right after its battery got totally drained at the NAIA 3′s parking lot. Inexplicably, the car’s driver side window stopped its automatic function even after the battery has been fully charged. I tried moving it up and down thinking that it has gotten stuck due to being left idle for more than half a month but the futile exercise didn’t solve the problem. The following day, I also opened the door panel in an attempt to see the window mechanism but I was prevented by the Honda’s complicated door design plus the thought that I’d do more harm than good. Even if the website mentions that this process is meant to reset the MCU, I was doubtful that it will work so I slept that night with just one question, “How can an intermittent wiper be connected to the window?” Even so, the solution proved its worth the very next day. Just after doing the abovementioned procedure, I was shaking my head in disbelief when the automatic window came back to life like some mechanical Lazarus. I tested and then re-tested the window and yes, the ridiculous solution does work. Park the car in a position wherein jumpstarting would be easier. For example, do not park facing the wall since this will require you to push it all the way back so it faces the “battery source” car especially if the jumpstart cable is short. Good thing I parked mine this way, else it would have been a longer night for the three of us. After jumpstarting the car, it is best to leave it idling or drive for an hour before totally shutting off the engine. I learned about this the hard way, when I turned the engine off just more than ten minutes since Albert Sebastian (who I soon learned is a reporter of Radyo ng Bayan DZRB) assisted me at the airport’s parking lot. Good thing, the crew of McDonald’s where I stopped pushed my car to a nearby Total gas station where another total stranger by the name of Jet didn’t hesitate to help me jumpstart my car again. Take note of Motolite’s 24-hour delivery number just in case you need further help – like a completely dead battery. Motolite’s Anytime, Anywhere Delivery number is (02)3706686. Last but not the least, don’t hesitate to ask for help. Some may reject you but others ever willing to help will be there soon. I’m currently hooked to Dan Brown’s books. During my December vacation I borrowed a book from a colleague and brought it with me in Bacolod. On my rest times I tried reading “The Da Vinci Code” – and under some sort of scrutiny from my pious mother. Answering, “it’s just a book” still somehow raised an eyebrow. On our way back home to Dasma after the holidays, we rented an airport taxi service and that made me finish the book while inside the cozy Toyota Innova (it cost us only Php 1.3K. Very cheap compared to availing Park n Fly’s service). That was at least a week of reading it. Not bad considering the other yuletide activities I have to attend. Now I borrowed another, “Angels & Demons” and I’m almost halfway since I started it just this Wednesday. Other than the conspiracy theories that seem to have captured my attention and that got me to ask a lot of questions regarding its possibility, one line in one of its pages made me reflect of what has been happening around us since then. The young priest spoke the single line with pain in his voice “God, grant me strength to accept those things I cannot change.” – pp. 169. This prayer made me pause and reflect on the changes I’ve seen and observed since last month. Some I might expand but others would remain as a one-liner for others who knew about it to explain. Dec (3rd week). Our company’s shuttle bus provider for more than ten years was changed. Dec 31. Just as the year ends come also the closure of our favorite restaurant – Saisaki ATC. No more sashimi. No more sukiyaki. I went back to the place on Jan 10 and to see it silent with doors locked and tables turned was a bit sad. I’m wondering where its crews have gone. Jan. Video City, a video rental store near our place closed. Most likely it’s another victim of the proliferation of pirated cds. I’ve seen ACA video Dasma closed before during the peak of piracy and seeing a second one close is just disappointing. Jan 18. Now the state of the old Bacolod airport is uncertain with the opening of Silay Airport. I don’t know if Bacolod City’s officials are still considering retaining the old one or if they will totally phase it out. With the recent experience I had both during arrival and departure – mostly due to deceitful porters and taxi drivers – I couldn’t agree more if they pick the latter option. But then the innocent & honest employees’ jobs are at stake. Hopefully they’ll be re-assigned. We are just starting the year and I hate to think about the things to come. I’m still trying to keep a positive attitude about what the future holds and whatever it will be, I’m hoping that we will be ready by then. Que sera sera, as my mother used to say. It’s been almost a month already when we had our vacation in Kuala Lumpur, Malaysia. Even until now, pauses in between work & other activities, I would find myself wondering if I have really got to be in Malaysia. It was as if the 7-day trip went by so fast as an F1 car would drive through 1 lap. Come to think of it, it was our F1 fanaticism that started this trip in the first place. My wife and I planned this trip, initially, just to see the 2007 F1 Sepang race. Sooner we’d learn that the minimum number of days our time sharing account would allow us is 1 week. Well, who gets upset over an extended vacation? If there’s anyone, it won’t be us. So to make this a vacation more fun, we convinced her brother and his wife to tag along. Our trip started on a Good Friday (pun intended). The airline we got was Airasia. Despite the long drive from Sto. Tomas, Batangas to Diosdado Macapagal Internation Airport we arrived earlier than expected in Clark, Pampanga. From there, our 4-hour flight to KLIA-LCCT started by 1145am. On time. The flight was smooth and uneventful, as the weather was good. Even with the absence of in-flight entertainment (no TV, no games) the view of the distinct dark Malaysian flight attendants that are beautiful and attractive nonetheless came as a bonus. 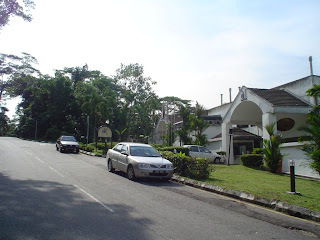 Upon arrival at LCCT and upon checking out at Immigration, we were picked by a taxi service that took us to Duta Vista Executive Suite in Persiaran Ledang after an hour of interesting trip. I can still remember when I had to peer through the van’s window when I saw the Petronas Twin Towers dominating the afternoon skyline. “We’re in Malaysia indeed”, I whispered to myself. After spending our Christmas eve in Batangas with my in-laws, wifey and I woke up by 4 a.m. and went straight to Park ‘N Fly to leave our car while in Bacolod. We reached the airport earlier than the 2-hour check-in time but the lines going to different counters were already packed. Some lines even crisscrossed each other to the frustration of most people including myself. While fidgeting I noticed that a number of foreign visitors (British, Americans, and other Asians) are going to places such as Kalibo, Cebu and Palawan but not one in Bacolod’s line. It made me wonder why. Soon I will have the answers. Our 8:45 a.m. flight was delayed. If not for Delifrance’s Christmas ham clubhouse sandwich—surprisingly, it’s one of the best sandwich I have tasted—that I ate for breakfast, I would have been grouchy as I always am given the situation. Then boarding time came after an hour. We had to walk from the departure area to our designated plane. It used to be a short one but it’s now some hundred meters walk—longer exposure to the glaring morning sun, to everyone’s dismay. It’s a good thing that, except for not being seated near the window, we had a smooth flight. The ‘bring me’ games, just like in any other Cebu Pacific flight, and the items for sale, which are nice last minute gifts, made the trip interesting. Of course, the beautiful flight stewardesses made it even better. Landing wasn’t bad either. At this point I was thinking that we can leave the airport in a jiffy after getting off the plane. But it didn’t happen. The ‘new and improved’ arrival area and baggage claim answered the questions why we haven’t got any foreigners on board. In these times of innovative technology, one would be shocked to see how the bags are handled. After manually unloading the bags from the cart, these were either dragged or tossed to a barricaded area where one can easily claim it if, and only if, he’s lucky to get the attention of porters handling it. (Damn, I should stop watching the Discovery channel.) Wifey and I didn’t get lucky fast, we had to wait. As it has been our practice to avoid the taxis right outside the airport terminal as they would normally overcharge, we walked out of the airport are to flag down cabs just along the highway. Unfortunately, two consecutive ones were grinches—or they could have thought of me just the same. I find it so shameful that I am being swindled by my kababayan just because I got bags, obviously coming from the airport. I can just imagine if it were Caucasians. I suspect that this is reason number two why foreigners aren’t queuing for Bacolod. Pissed, I gave up hailing a cab. We decided to board a jeepney instead that would take us downtown. Along the way though I couldn’t help but notice the scattered garbage, the uncut grasses in the city plaza, and the stagnant sidewalk canals. This is not the Bacolod I used to know for years. What an un-welcoming sight. Reason number three. From downtown, we finally got a good taxi driver. Well, at least my resolution—for some years already—not to generalize anything or anyone still works. Just some of them are bad, not all. Eventually, we arrived home by 11 p.m. Tatay and nanay and some of my siblings were already there. As expected, a good lunch of sea foods was served. Tatay cooked sweet and sour fish and tanigue kinilaw—both dishes are his specialty—and prepared some fruits for dessert. It was one hearty lunch. Home sweet home, and it’s still Christmas day. After spending our Christmas Eve in Batangas with my wife’s family, we woke up by 4am the next morning and had to go straight to Park and Fly to leave our car while we are in Bacolod. From there we were whisked to the Manila Domestic Airport through their shuttle service. We were on queue earlier than our 2-hour check-in time. Even then, the lines of travelers going to different destinations were already jam packed. Some lines even crisscrossed each other to the frustration of most people including myself. One of the noticeable things is the number of foreign visitors (British, Americans, and other Asians) going to places such as Kalibo, Cebu and Palawan. When I checked there’s no one in Bacolod’s queue. I’m wondering why. The 845am flight was delayed for more than an hour. If not for the Delifrance’s Christmas Ham Clubhouse sandwich (surprisingly, it’s one of the best sandwich I had tasted) that I was eating for breakfast, I would have been grouchy as I always am given the situation. Boarding time came. To my wife’s dismay we had to walk from the departure area to our designated plane. It used to be a short one. Now it’s some 300 meters walk and longer exposure (this is what she actually hates) to the glaring morning sun as the plane themselves (also to other domestic places) were also on parallel queue. One can just imagine how many people are traveling even on this Christmas day. Except for being not on the window seat, the flight was smooth as usual. The on board “bring me” games was held just like every Cebu Pacific flight. This time though my wife was too tired to actively participate. The addition of tokens and corporate items for sale (nice gifts for those you realized you forgot), made it even more interesting. And of course, the beautiful flight stewardesses are still there. Landing wasn’t bad either. I was at this point thinking that we can leave the airport in a jiffy after alighting from the plane. But that just isn’t going to happen. The “new and improved” arrival area and baggage claim answered (just maybe one of the reasons why) the question why we haven’t got any foreigners on board. In these times of high-tech, innovative and “whatever-you-call-it” technology, one would be shocked to see how the bags are handled. After manually unloading the bags from the cart, these were just either dragged or tossed on a metal barricaded floor where you can easily claim it if you’re lucky to get the attention of porters handling it. Damn, I should stop watching the Discovery channel. After some frustrating time, I was able to claim our bags. These is one of the times I’ll recite in my mind “Good things come those who wait” as a mantra. As it has been our practice to avoid the taxis right outside the airport terminal as they would normally overcharge, we walked out of the airport vicinity to flag down an empty taxi just along the road. Unfortunately, two consecutive cabs I got were Grinches (or they could have thought of me just the same). I find it so shameful when I am being swindled by someone who’s a kababayan (town-mate for this matter) just because I got bags (obviously coming from the airport). I can just imagine if it were especially Caucasians. It’s now reason # 2 why the foreigners aren’t queuing for Bacolod? I gave up hailing a cab right in front of the airport. We decided to board a jeepney instead that would take us to downtown. Along the way though I couldn’t help but notice the scattered garbage, uncut grasses in the city plaza & the stagnant sidewalk canals. This is not the Bacolod I used to know for years. What an un-welcoming sight. Reason # 3. From downtown, we were lucky enough to get an honest taxi driver as I’ve observed that there were only a few of them (pun intended) on duty on this Christmas day as the streets are somewhat empty than usual. Well, at least my resolution (for some years already) of not generalizing anything or anyone will still work. At least just SOME of them are bad. NOT ALL. Eventually, we got home. My tatay and nanay were there with some of my siblings. It was almost 11am. And as expected a good lunch of seafoods were served. Tatay cooked sweet and sour fish, tanigue kinilaw (both which are his specialty) and with some fruits for dessert. It was another hearty lunch. Thankfully we are home. Home sweet Home. And it’s still Christmas day.